Holy Trinity Church is located just outside of Stroudsburg in the Pocono Mountains of Pennsylvania. Take the Dreher Ave exit (exit 306). Turn right at the end of the ramp. Turn right at the stop light. Turn left at the next stop light on to Main St (Rt 611). Continue past the blinking light until the first traffic light (Chipperfield Dr). Turn right onto Chipperfield Dr. Continue up Chipperfield Dr past Stroudsburg Middle School. Trinity Court is on the left of Chipperfield Dr. The Church and sign are visible when you turn on to Trinity Court. Take the Ninth St Exit (exit 303) onto Rt 611 east to the second traffic light. Turn left at the light onto Chipperfield Dr. Continue on Chipperfield past the Stroudsburg Middle School to Trinity Court on the left. 9:00 AM Reading of the Hours. 9:30 AM Divine Liturgy followed by coffee hour and Sunday School. On December 6, 1976, a group of Orthodox Christians met at East Stroudsburg State College to celebrate Vespers with His Grace, (then) Bishop Herman and Fr Daniel Donlick. Mr Nicholas Lezinsky of Allentown served as lay coordinator. From January 1977 through June of the same year, Liturgy was celebrated by Fr Sebastian (Gyza) of St Tikhon’s Monastery in the conference rooms of the Howard Johnson Motel in Delaware Water Gap and at the Pocono Hilton Hotel in Stroudsburg. On July 17, 1977, through the efforts of Bishop Herman, the mission parish moved to the St Mark’s Summer chapel in Delaware Water Gap, where Fr Sebastian continued serving the needs of the people. The building was rented for five years from the Roman Catholic Diocese of Scranton. The parishioners were responsible for the payment of the utility costs. The building had no running water and no meeting rooms for church activities. From January to July, 1978, Fr Joseph Toroney served pastoral responsibilities at the parish. Jacob Fremenko and David Lezinsky served as choir directors for the first Liturgy. In July, 1978, Fr Daniel Donlick was assigned duties as pastor of the fledgling parish. Seminarian John Onofrey, who came to the parish in June, 1980, did an exceptional job as choir director. When John Onofrey was ordained to the priesthood, Mrs Dorothy Strzelczyk accepted the responsibilities of choir director. She has performed masterfully in this position and the parish choir contributes beautifully to the services. Under the capable and spiritual direction of Fr Donlick, a Land and Building Search Committee was formed consisting of parishioners Spas Raikin, Ruby Raikin, Helen Kessler and Sonya James. For four years these individuals searched the central area of Monroe County, PA for affordable land and buildings. Under the leadership of parishioner Leopold (Paul) Bonisese, parishioners conducted various fund raising activities, such as concerts and flea markets. A pledge drive was conducted to purchase needed land. St Anne’s Guild, the parish women’s group, held bake sales, flea markets, and craft projects, with all parishioners working diligently. 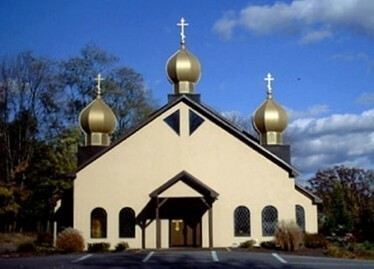 On November 4, 1982, the mission parish purchased an existing church structure, centrally located in the Stroudsburg-Pocono area. Fr Donlick and the parishioners celebrated Divine Liturgy in the new church building on December 5, 1982, the sixth anniversary of the founding of the parish. In November, 1986, Fr Donlick was assigned full-time responsibilities as Dean of St Tikhon’s Seminary and as Secretary-Treasurer of the Diocese of Philadelphia and Eastern Pennsylvania. At that time, Fr Neal Carrigan was assigned pastor of Holy Trinity Parish. He was also President/CEO of Meals on Wheels in Scranton, PA.
Much to our joy, parish membership has increased substainsially. However, a great strain was placed on the limited space of the small church. With the encoragement of Fr. Carrigan, a nearly five-acre parcel of land was purchased in 1990, and an aggressive building fund drive was initiated. Before long, a 4,000 square foot post-and-beam church structure and a beautiful new church hall were constructed. Much of the needed funds were donated by parishoners and friends of the parish. Pieroghi and chowder making became a way of life for most of the parishoners. Many hours of laborious work were donated by scores of people in an effort to reduce the cost of construction and landscaping. The new church was consecrated on September 28,1996, by Archbishop Herman. A large number of diocesan priests concelebrated with his Eminence. As a part of the consecreation, the new Iconostasis and hall were blessed. The occasion was made more glorious by the love,prayers and attendence of several hundred faithful and friends. In September of 2001 the church celebrated its 25th anniversary with Archbishop Herman and other clergy concelebrating. As part of this event, three new domes and a new bell tower were blessed. In June of 2002, we bid farewell to Fr. Neal Carrigan, and joyously welcomed our first full-time priest Fr. Nicholas Solak III and his family.